After defeating the Continental Army at the Battle of Brandywine about a month earlier, and the Battle of Paoli on September 20, General William Howe outmaneuvered General George Washington, seizing Philadelphia, the capital, on September 26. 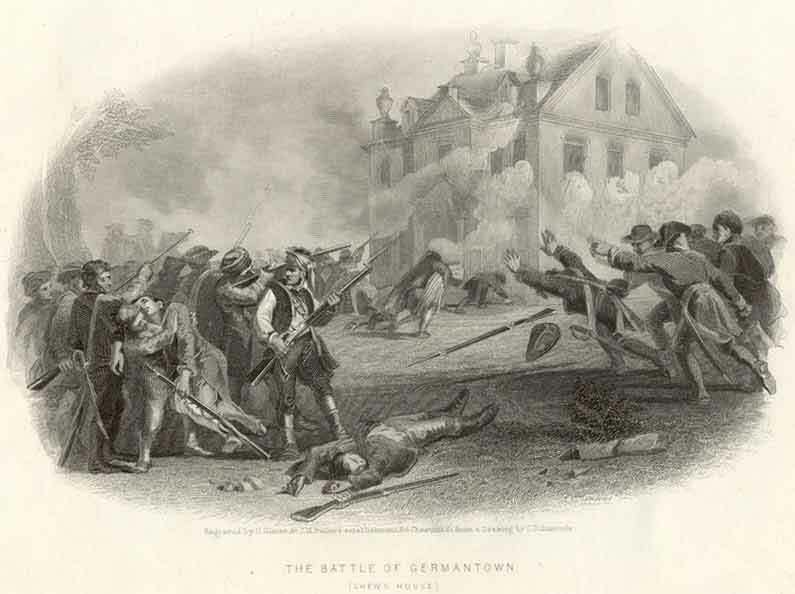 Howe left a garrison of some 3,000 troops in Philadelphia, while moving the bulk of his force to Germantown, then an outlying community to the city. Learning of the division, Washington determined to engage the British. 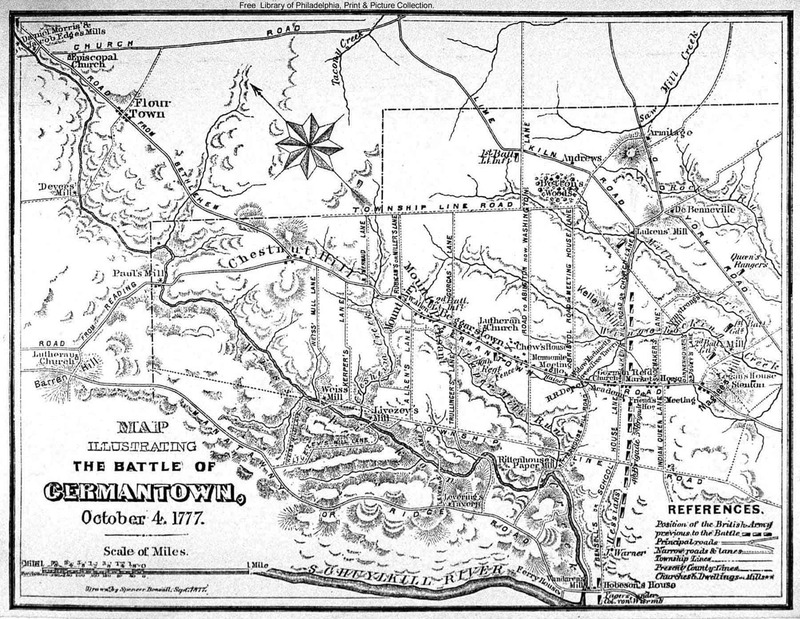 Washington's plan called for four separate columns to converge on the British position at Germantown. 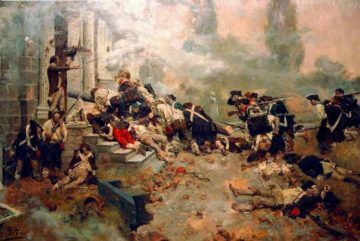 The two flanking columns were composed of 3,000 militia, while the center-left, under Major General Nathanael Greene, the center-right under Major General John Sullivan, and the reserve under Major General William Alexander "Lord Stirling" were made up of regular troops. 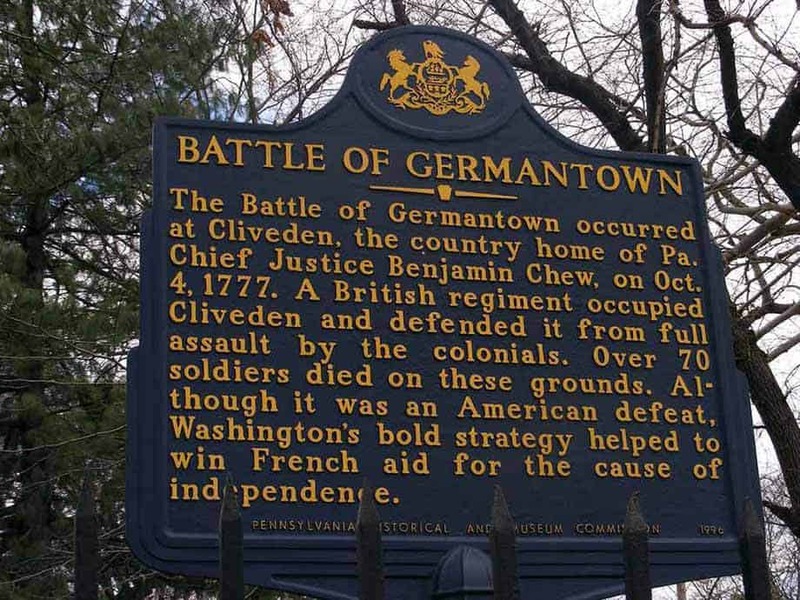 The ambition behind the plan was to surprise and destroy the British force, much in the same way as Washington had surprised and decisively defeated the Hessians at Trenton. After a sharp contest, Sullivan's column routed the British pickets. 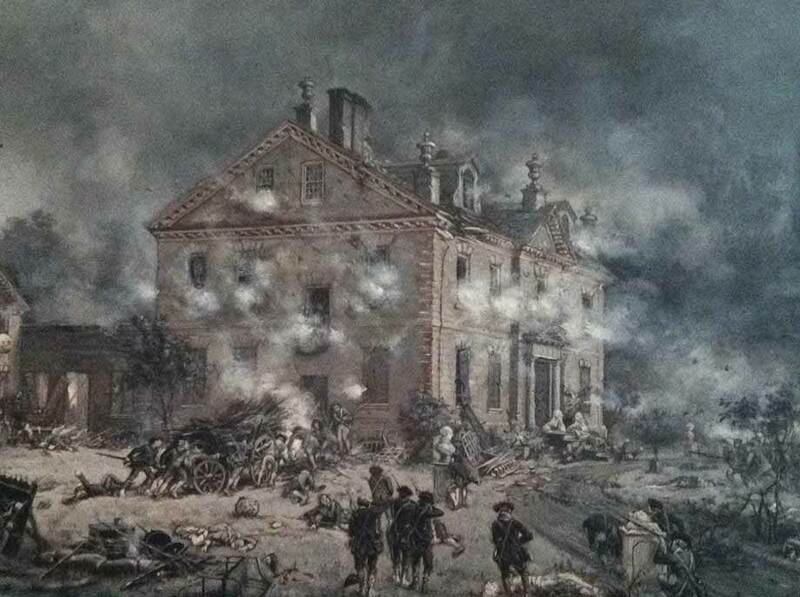 Unseen in the fog, around 120 men of the British 40th Foot barricaded the Chew Mansion. When the American reserve moved forward, Washington made the erroneous decision to launch repeated assaults on the position, all of which failed with heavy casualties. Penetrating several hundred yards beyond the mansion, Sullivan's wing became dispirited, running low on ammunition and hearing cannon fire behind them. As they withdrew, Brigadier General Anthony Wayne's division collided with part of Greene's late-arriving wing in the fog. Mistaking each other for the enemy, they opened fire, and both units retreated. Meanwhile, Greene's left-center column threw back the British right. With Sullivan's column repulsed, the British left outflanked Greene's column. The two militia columns had only succeeded in diverting the attention of the British, and had made no progress before they withdrew. Despite the defeat, France, already impressed by the American success at Saratoga, decided to lend greater aid to the Americans. Howe did not vigorously pursue the defeated Americans, instead turning his attention to clearing the Delaware River of obstacles at Red Bank and Fort Mifflin. After unsuccessfully attempting to draw Washington into combat at White Marsh, Howe withdrew to Philadelphia. Washington, his army intact, withdrew to Valley Forge, where he wintered and re-trained his forces. Armies - American Forces was commanded by Gen. George Washington and consisted of about 11,000 Soldiers. British Forces was commanded by Gen. William Howe and consisted of about12,500 Soldiers. Casualties - American casualties were estimated to be 152 killed, 521 wounded, and 438 missing/captured. British casualties were estimated to be 71 killed, 450 wounded, and 14 missing/captured. Outcome - The result of the battle was a British victory. 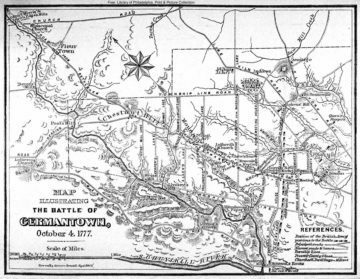 The battle was part of the Philadelphia Campaign 1777-78. A thick fog clouded the battlefield throughout the day, greatly hampering the coordination between units. The vanguard of Sullivan's column, upon Germantown Road, opened fire upon the British pickets on Mount Airy, just after sunrise at 5:00 AM. The British pickets fired their cannon in alarm, and resisted the American advance. Howe rode forward, thinking they were being attacked by foraging or skirmishing parties, and ordered his men to hold their ground. It took a substantial part of Sullivan's division to finally overwhelm the British pickets, and drive them back into Germantown. Howe believed his men were facing only light opposition. Just then, three American guns came into action, opening fire with grapeshot. Howe and his staff quickly withdrew out of range. Several British officers were shocked to see their own soldiers rapidly falling back before the American attack. Cut off from the main force, Colonel Musgrave, of the British 40th Regiment of Foot, ordered his six companies of troops, around 120 men, to barricade and fortify the stone house of Chief Justice Chew, called Cliveden. The American troops launched a determined assault against Cliveden, however, the outnumbered British defenders repulsed their attempts, inflicting heavy casualties. Washington called a council of war to decide how to deal with the fortification. Some of his subordinates favored bypassing Clivden entirely, leaving a regiment behind to besiege it. However, Washington's artillery commander, Brigadier General Henry Knox, advised it was unwise to allow a fortified garrison to remain under British control in the rear of a forward advance. Washington agreed with Knox. Brigadier General William Maxwell's brigade, which had been held in reserve, was brought forward to storm Cliveden. Knox positioned four 3lb. cannon out of musket range to bombard the mansion. However, the thick walls of Cliveden withstood the bombardment from the light field guns. The Americans launched a second wave of infantry assaults, all of which were repulsed with heavy losses. 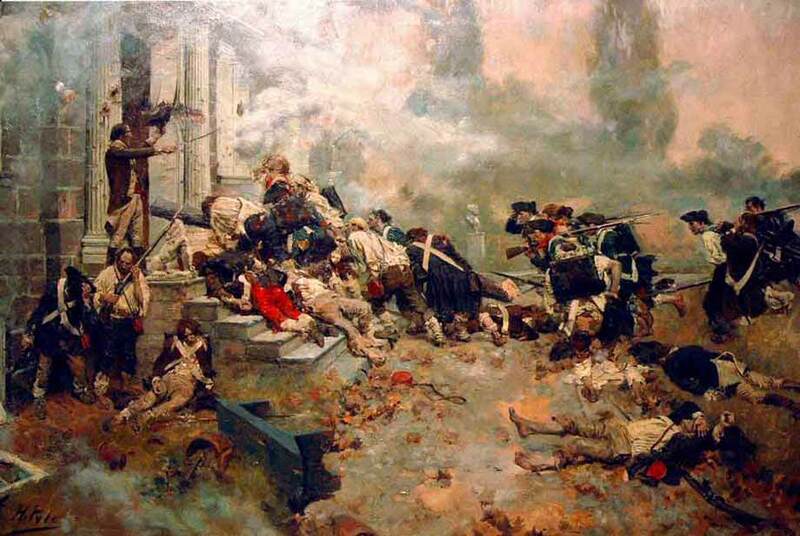 The few Americans who managed to get inside the mansion were shot or bayoneted. It was becoming clear to the Americans that Cliveden was not going to be taken easily. Among this assault was Lieutenant John Marshall of the Virginia Line, the future Chief Justice of the United States, who was wounded during the attack. Prior to Maxwell's futile attack against Cliveden, Sullivan's division advanced beyond in the fog. Sullivan deployed Brigadier General Thomas Conway's brigade to the right, and Wayne's brigade to the left before advancing on the British center-left. The 1st and 2nd Maryland Brigades of Sullivan's column paused frequently to fire volleys into the fog. While the tactic was effective in suppressing British opposition, his troops rapidly ran low on ammunition. Wayne's brigade to the left of the road moved ahead, and became precariously separated from Sullivan's main line. As the Americans launched their attack on Cliveden, Wayne's brigade heard the disquieting racket from Knox's artillery pieces to their rear. To their right, the firing from Sullivan's men died down as the Marylanders ran low on ammunition. Wayne's men began to panic in their apparent isolation, and so he ordered them to fall back. Sullivan was subsequently forced back, although the regiments fought a stubborn rear-guard action. Since the British units pursuing them were redirected to fight Greene's column, Sullivan's men fell back in good order. 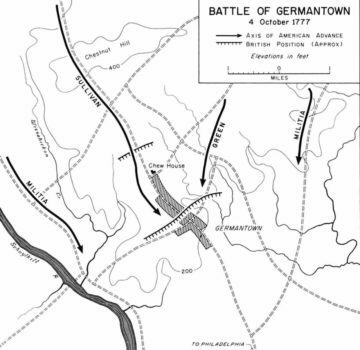 Meanwhile, Greene's column on Limekiln Road had finally caught up with the bulk of the Americans at Germantown. Greene's vanguard engaged the British pickets at Luken's Mill, driving them back after a savage skirmish. The fog that clung to the field was compounded by palls of smoke from the cannon and musket fire, throwing Greene's column into disarray and confusion. One of Greene's brigades, under Brigadier General Adam Stephen, veered off-course and began following Meetinghouse Road, instead of rendezvousing at Market Square with the rest of Greene's troops. The wayward brigade collided with Wayne's brigade, and mistook them for British. The two American brigades opened fire on each other in the fog, causing both to flee. 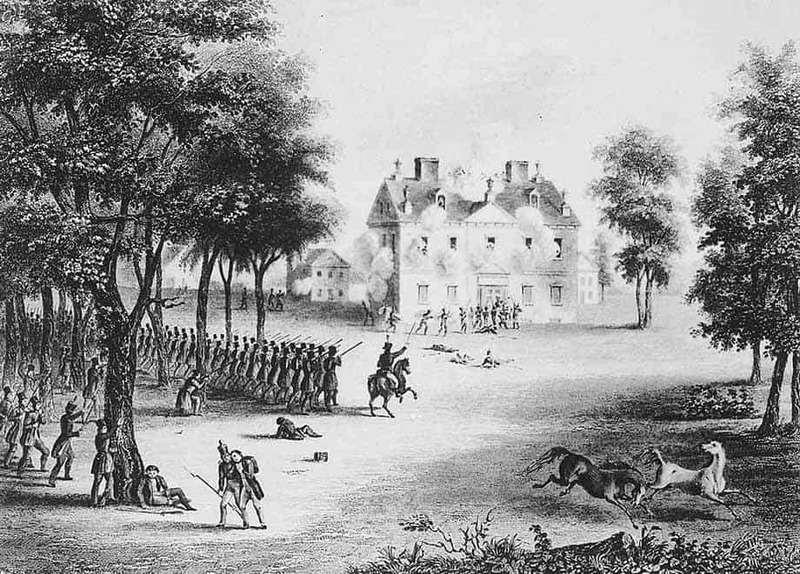 The withdrawal of Wayne's New Jersey Brigade, having suffered heavy losses attacking Cliveden, left Conway's right flank exposed. 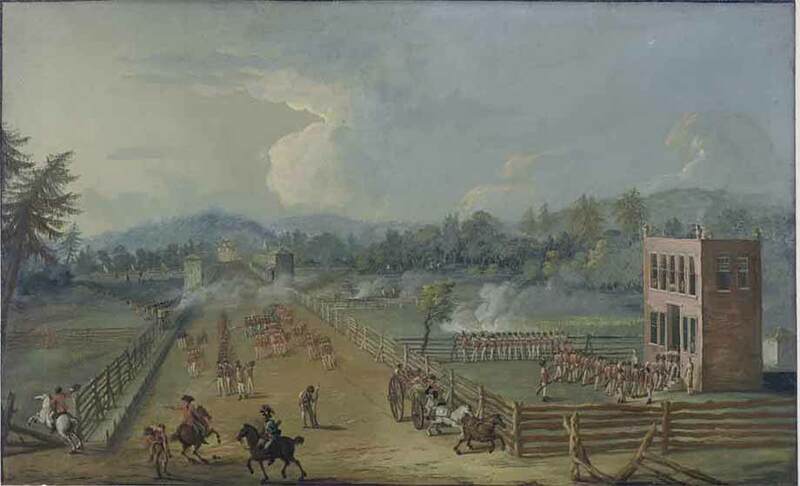 To the north, an American column led by McDougall came under attack by the Loyalist troops of the Queen's Rangers, and the Guards of the British reserve. After a brutal contest, McDougall's brigade was forced to retreat, having suffered heavy losses. Despite the reversal in fortune, the Continentals were still convinced of a possible victory. 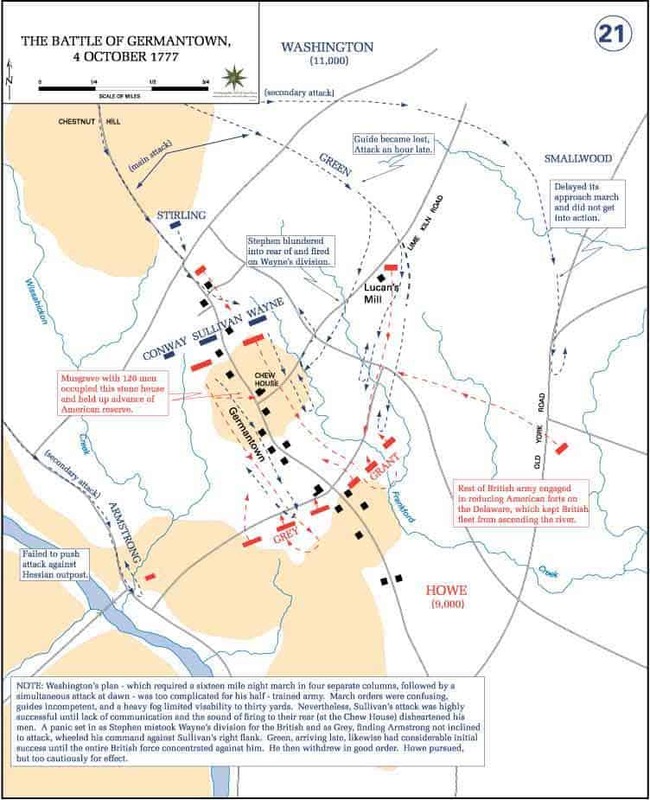 The 9th Virginia Regiment of Greene's column launched a determined attack on the British lines as planned, managing to break through and capturing a number of prisoners. However, they were soon surrounded by two arriving British brigades under Cornwallis. Cornwallis then launched a counter-charge, cutting off the Virginians completely, forcing them to surrender. Greene, upon learning of the main army's defeat and withdrawal, realized he stood alone against Howe's entire army, and so withdrew. The primary attacks on the British and Hessian camp had all been repulsed with heavy casualties. Washington ordered Armstrong and Smallwood's men to withdraw. Maxwell's brigade, still having failed to capture Cliveden, was forced to fall back. Howe ordered a pursuit, harrying the retreating Americans for some 9 miles, though he did not follow up on his victory. The pursuing British forces were finally forced to retire in the face of resistance from Greene's infantry, Wayne's artillery, and a detachment of dragoons, as well as the coming of the night. The battle lasted almost three hours. During this time, the battle proved that Americans could stand up and fight against the British. Also, it provided a morale boost because of the near win. Plus, it got the French to think about helping the American cause. Of course, their help would prove to be immeasurable at the Battle of Yorktown. Washington blamed the lost battle, literally all on the fog-of-war. Although the fog was a roadblock in his plans, several other factors contributed to the failure. The drunkenness of Stephen who, at the climax of the fight, fired into his own troops. The militia not showing up or providing very little support to the Continentals. The delays, especially the delay at the Chew House, which cost Washington the surprise and the hour delay for Greene which enabled the British to prepare for an attack. 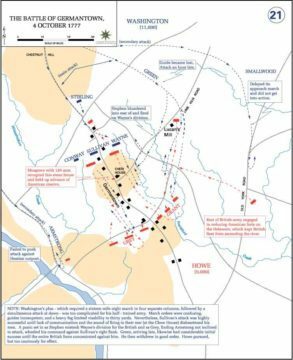 Also, the shortage of ammo was a crucial factor in the battle and, to some extent, Washington himself can be blamed because of the complexity of his plan involving a night march with untrained troops, especially the militia. In his report to Congress, Washington blamed the fog and the Chew House "annoyance" for the collapse. Stephen was court-martialed, found guilty of drunkenness, and dismissed from the army. Greene's unfortunate tardiness was perhaps the biggest factor in blunting the attack. It may be that Washington's strategy was too sophisticated for field officers who lacked tactical experience; and, there were many new, raw soldiers among both the Continentals and the militia. What snatched victory from Washington's grasp were these imponderables. The Americans believed they had nearly succeeded at Germantown, and this lifted morale, despite losses. Howe recognized, after his narrow victory, that he could not string out his troops as he had done without courting attack. 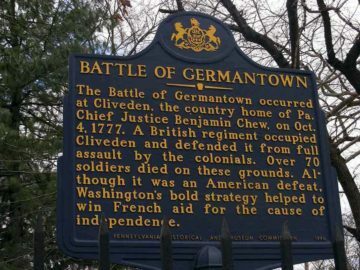 A few weeks later, he evacuated Germantown and reestablished his troops in a line of forts north of Philadelphia.